SAMUEL KNIGHT a MORMON SHOOTER AND CLUBBER, a private in company H of the 4th Battalion, Lee's battalion; born in Jackson County, Missouri but was descended from New England Yankee stock. 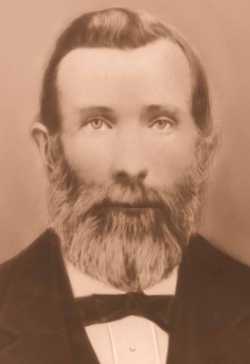 His grandfather, Joseph Knight, and his father, Newell Knight had been early supporters of the Mormon prophet-leader Joseph Smith in upstate New York . September 5, having received orders from Cedar City, Knight carried orders south to Fort Clara (and perhaps Washington) to incite Indians on the lower Santa Clara to gather at Mountain Meadows. Monday, September 7th in the evening, following the first attack on the emigrants, he and other southern militiamen met John D. Lee south of the Meadows, joined him and moved up to the Meadows. Friday the 11th, Lee recruited Knight and Samuel McMurdie to drive wagons to the emigrant wagon circle and carry away young children and wounded. After the final massacre these wagons carried the surviving children to Hamblin's ranch. In 1876, Knight testified in the second trial of John D. Lee . In the 1890s and the early twentieth century he gave several important interviews and statements concerning the massacre. Information on the above Mormon Shooter and Clubber, was obtained from the following: Pioneers and Prominent Men of Utah, The 1857 Iron County Militia Project, Mountain Meadows Massacre Assassins, Bagley, Lee, Gibbs, Backus, Dunn, Denton and Shirts. Read how the Mormon Killers got paid by the US Government for caring for the orphan children after they had killed their parents.